Once again, thanks to a plethora of frozen foods, the Man and I plus our friend Aaron had a decent meal regardless of the hours I had spent and still needed to spend sitting at a computer busting out MAED papers and such. 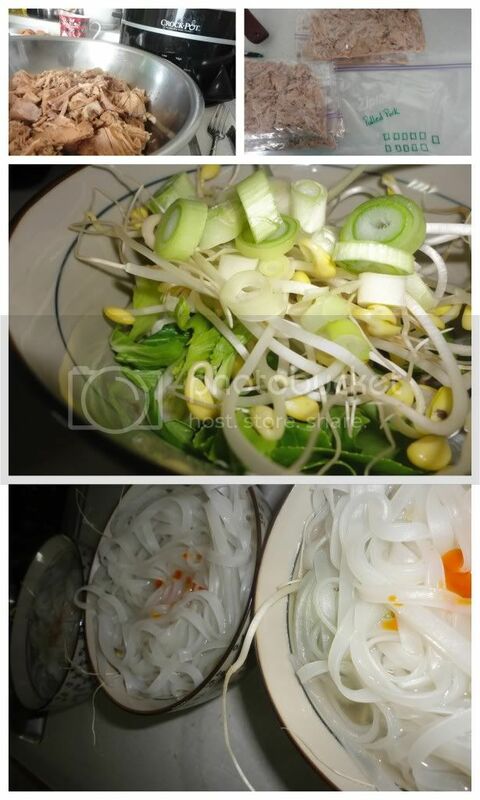 Soak rice noodles in warm water. In a large pot bring 1qt. of beef or pork broth, 4 cups water and a 1 inch sliced piece of ginger to a boil. Divide 1 cup (or two if you want more meat) pork, 6 baby bok choy, 1 1/2 cups bean sprouts, and 1/4 cup sliced green onions among 4 large soup bowls. Divide soaked noodles into four equal portions. Using a mesh strainer lower one portion of noodles at a time into the boiling broth for 1-2 minutes. Transfer noodles to soup bowls, continue until all noodles are cooked. Ladle hot broth into bowls serve with fresh cilantro, lime and hot chili oil.